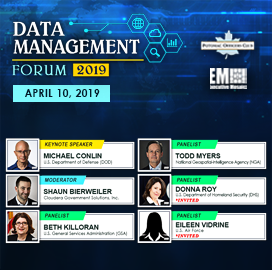 Donna Roy, executive director of the Department of Homeland Security Information Sharing and Services Office, will be featured as a panelist during the Potomac Officers Club’s 2019 Data Management Forum on April 10th at the 2941 Restaurant in Falls Church, Va.
During the forum, GovCon leaders from the public and private sector will address the great challenges encountered in data management. These include recruiting the best talent internationally, discussing augmented data management and how AI and machine learning are transforming the data landscape. Roy joined DHS as director of the Enterprise Data Management Office in December 2006 and served in the role for four years. 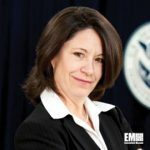 She previously served as executive director of the Information Sharing Environment Office for five years before transitioning to her current role in March 2016. Prior to joining DHS, Roy was the program manager of the National Biological Information Infrastructure Program with the U.S. Geological Survey for five years. She worked for Transamerica Real Estate Information Companies for three years as vice president of technology development. Roy has been recognized as one of the top women in the technology sector. She won the 2014 Outreach and Impact: HSIN Program Designer Award and the DHS Secretary Award for Excellence in 2014 and 2016.